Many useful products are derived from reused tires and other rubber products. If tires are incinerated to reclaim embodied energy then they can yield substantial quantities of useful power. In Australia, some cement factories use waste tires as a fuel source. There is an enormous potential for reclamation and reuse of rubber in developing countries. There is a large wastage of rubber tires in many countries and the aim of this brief is to give some ideas for what can be done with this valuable resource. Whether rubber tires are reused, reprocessed or hand crafted into new products, the end result is that there is less waste and less environmental degradation as a result. In developing countries, there is a culture of reuse and recycling. Waste collectors roam residential areas in large towns and cities in search of reusable articles. Some of the products that result from the reprocessing of waste are particularly impressive and the levels of skill and ingenuity are high. Recycling artisans have integrated themselves into the traditional market place and have created a viable livelihood for themselves in this sector. The process of tire collection and reuse is a task carried out primarily by the informal sector. tires are seen as being too valuable to enter the waste stream and are collected and put to use. There are many ways in which tires and inner tubes can be reused or reclaimed. The waste management hierarchy dictates that re-use, recycling and energy recovery, in that order, are superior to disposal and waste management options. This hierarchy is outlined in Table 3 below (click to enlarge). Damaged tires are, more often than not, repaired. Tubes can be patched and tires can be repaired by one of a number of methods. Regrooving is a practice carried out in many developing countries where regulations are slacker and standards are lower (and speeds are lower) than in the West. It is often carried out by hand and is labour intensive. The use of retread tires saves valuable energy and resources. A new tire requires 23L of crude oil equivalent for raw materials and 9L for process energy compared with 7L and 2L respectively for retreading. tires of passenger vehicles can generally be retreaded only once while truck and bus tires can be retreaded up to six times. Retreading is a well established and acceptable (in safety terms) practice. 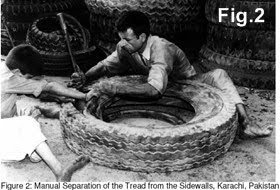 The process involves the removal of the remaining tread (producing tire crumb – see later) and the application and vulcanization of a new tread (the ‘camel back’) onto the remaining carcass. In Nairobi about 10,000 tires a week are received for retreading. Secondary reuse of whole tires is the next step in the waste management hierarchy. tires are often put to use because of their shape, weight, form or volume. Some examples of secondary use in industrialized countries include use for erosion control, as tree guards, in artificial reefs, fences or as garden decoration. In developing countries wells can be lined with old tires, docks are often lined with old tires which act as shock absorbers, and similarly crash barriers can be constructed from old tires. Old inner tubes also have many uses; swimming aids and water containers being two simple examples. The next step in our hierarchy involves the material being broken down and reused for the production of a new product. 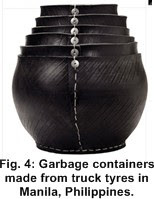 As mentioned earlier, in developing countries this hand reprocessing of rubber products to produce consumer goods is well established and the variety of products being made from reclaimed tires and tubes is astonishing. The rubber used in tires is a relatively easy material to reform by hand. It behaves in a similar manner to leather and has in fact replaced leather for a number of applications. 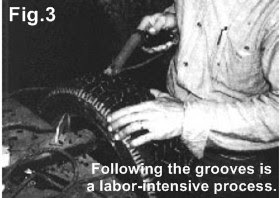 The tools required for making products directly from tire rubber are not expensive and are few in number. Shears, knives, tongs, hammers, etc., all common tools found in the recyclers’ workshop, along with a wide range of improvised tools for specialized applications. Shoes, sandals, buckets, motor vehicle parts, doormats, water containers, pots, plant pots dustbins and bicycles pedals are among the products manufactured. Another way in which physical reuse can be achieved is by reducing the tire to a granular form and then reprocessing. This can be a costly process and there has to be a manufacturer willing to purchase the granules. Crumb rubber from the retreading process can be used in this way, as it is a good quality granulated rubber. The reprocessing techniques used are similar to those described in earlier chapters. Granulate tends to be used for low-grade products such as automobile floor mats, shoe soles, rubber wheels for carts and barrows, etc., and can be added to asphalt for road construction, where it improved the properties of this material. Acid reclamation – uses hot sulphuric acid to destroy the fabric incorporated in the tire and heat treatment to render the scrap rubber sufficiently plastic to allow its use as a filler with batches of crude rubber. Alkali recovery – Reclaimed rubber, treated by heating with alkali for 12 to 30 hours, can be used as an adulterant of crude rubber to lower the price of the finished article. The amounts of reclaimed rubber that are used depend on the quality of the article to be manufactured. One form of thermal recovery is pyrolysis. This involves heating the tire waste in the absence of oxygen which causes decomposition into gases and constituent parts. It is a technology which is still immature in the tire-reprocessing field. tires consist of around 60% hydrocarbons, which is a store of energy that can be recovered by incineration. The heat produced can be used directly in processes such as cement making, or to raise steam for a variety of uses, including electricity generation. Again, this technology requires sophisticated plant and its application is limited when looking at small-scale enterprise. Landfill is the final step in the waste management hierarchy. The landfill disposal of tires, if properly managed, does not constitute an environmental problem. However, concerns about conserving resources and energy have seen an increasing opposition to landfilling. Also, public sanitation and municipal waste management is often ineffective in developing countries and scrap tires are often found littering the streets. Thanking for sharing this article, I learn many methods on reusing tires. I have seen waste tires are used for damping. I am looking to find out if there is anybody out there that knows if there are hazards to recycling bike inner tubes into jewelry. I work in an institution with children and can’t find any information in Denmark as to if there are any types of poisons/hazards in bicycle inner tubes. We of course don’t want to use them if they have any type of hazardous material in them.